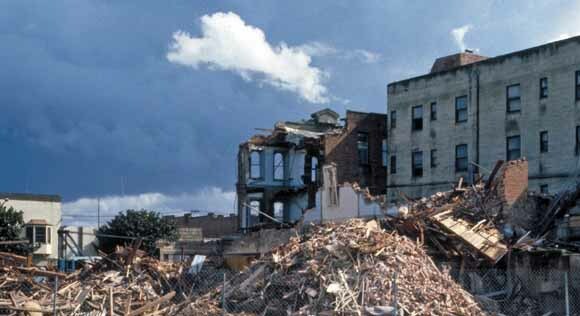 Approximately 16,000 housing units were uninhabitable after the earthquake including 13,000 in the San Francisco Bay region. Another 30,000-35,000 units were moderately damaged in the earthquake. Renters and low-income residents were particularly hard hit. Failure of highway systems was the single largest cause of loss of life during the earthquake. Forty-two of the 63 earthquake fatalities died when the Cypress Viaduct in Oakland collapsed. The cost to repair and replace highways damaged by the earthquake was $2 billion, about half of which was to replace the Cypress Viaduct. Major bridge failures were the result of antiquated designs and inadequate anticipation of seismic loading. Twenty one kilometers (13 mi) of gas-distribution lines had to be replaced in several communities and more than 1,200 leaks and breaks in water mains and service connections had to be excavated and repaired. At least 5 electrical substations were badly damaged, overwhelming the designed redundancy of the electrical system. Instruments in 28 buildings recorded their response to earthquake shaking that provided opportunities to understand how different types of buildings responded, the importance of site amplification, and how buildings interact with their foundation when shaken (soil structure interaction).